Backsplash – Changing your backsplash provides an instant facelift to your kitchen. It’s all within a day’s work so it shouldn’t interfere too much with your kitchen routine either. But if you are planning on something temporary, then tile stickers are your best bet. They work perfectly and can be easily peeled off when you want a change. Color – Painting your kitchen in light shades has an immediate impact on the illusion of space. Light-colored walls will make your kitchen look larger and more spacious. Go for gold – Changing your hardware doesn’t cost much and increases the classy look of your kitchen. Consider replacing your worn-out cabinet knobs and handles with golden ones. They would match perfectly with light-colored backgrounds. A gold-shaded faucet would be the crowning glory of your kitchen. Lighting – Add an unexpected element into your kitchen by including a chandelier or pendant lights. Regular wall light sconces are just that – regular, but decorative lights give the most-used room in your home a unique personality. Additional light also makes your kitchen look spruced-up and bright. Clear the Clutter – Nothing takes away the charm of your kitchen than disarray and clutter. Find ways to keep your smaller utensils, spice bottles and small appliances like toasters, kettles and mixers tucked away. Clean worktops and spaces add to the elegance in a room. Cabinets – You should consider replacing old cabinet doors with new ones. Aside from fitting better, they will add a much-needed dash of glam to your kitchen. To amplify the sleek look, you could consider replacing with glossy or glass doors. Foliage – A touch of lively green plants or two or even more, will instantly bring life to your kitchen. If you have a wide windowsill, you could even have your own organic herb garden! Crockery Display – If you don’t have a display cabinet, consider installing shelves to display crockery that are your pride and joy. It will create a high-end boutique-like effect. 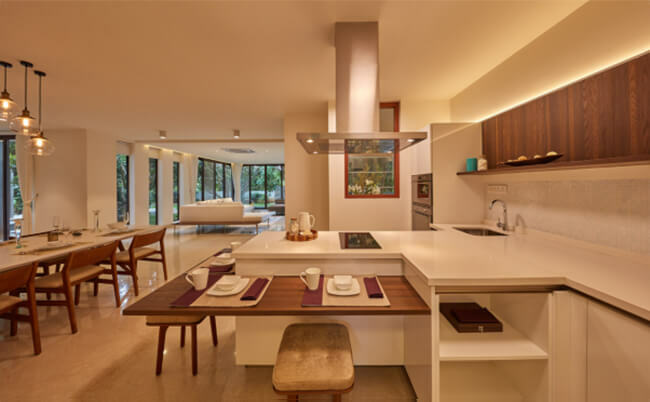 If you enjoy having fun doing up your home and need a spacious kitchen, then check out the luxurious ‘Under the Sun’ villas at Devanahalli, Bangalore. They are located within a green fruiting orchard and are a joy to behold. Get more information here: https://www.underthesun.co.in/.